I arrived in Alicante, but my suitcase did not. Not a great start. But ok, at least I had made it this far, I was back in Europe and felt one step closer to get things back on track. No stress. I was also lucky enough to be staying with friends that could lend me clothes for the first few days until the luggage arrived. None of that was a problem. 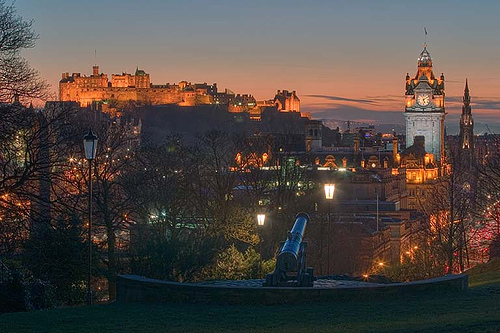 Edinburgh Castle, by Duncan Smith, lovingly stolen from http://www.lastminutecottageholiday.co.uk/visitedinburghscotland.html. 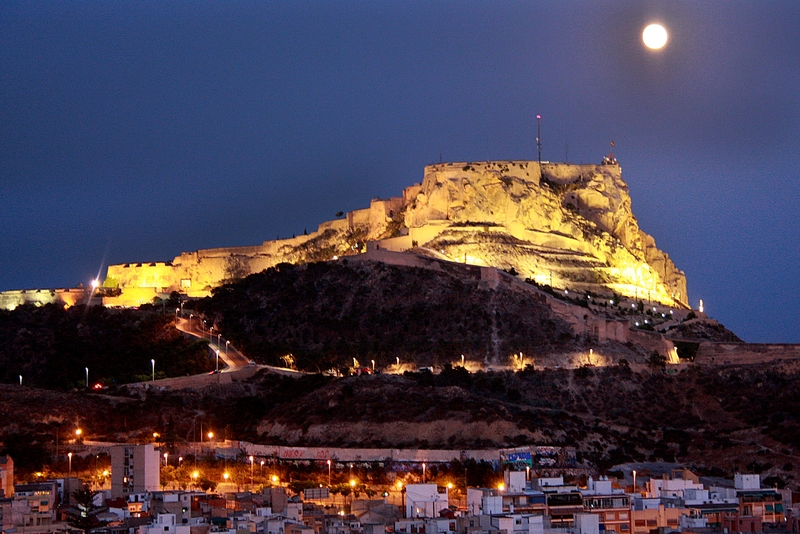 The two cities are also about the same size, even though Alicante has a slightly smaller population but looks slightly more like a big city with its shiny shopping centres and beach resorts. Alicante is also a popular spot for Brits, so it’s common to hear English spoken on the streets and see English menus in bars and restaurants. Similarities end there, and the biggest difference is: it NEVER rains in Alicante! In fact, when you get out of the city and go to the surrounding towns or villages (like the one I was staying in, San Vicente de Raspeig), what you see is a desert with dunes and mountains of red earth that are much more akin to a Moroccan than to a Scottish landscape. It is still beautiful, in spite of all the problems caused by the constant state of drought in the region. Politically speaking, Alicante is part of the Generalitat Valenciana, and therefore somewhat removed from Madrid-centered politics. Most of the people I spoke to were very much in favour of a Spanish Republic, a feeling strengthened by the recent abdication of King Juan Carlos. However, there didn’t seem to be an organised enough pro-Republic movement there, and even less so a movement for independence like in Catalunya. Curious thing I learned: Valencian and Catalan are pretty much the same language (which I can sort of understand when spoken and written, but haven’t learned to speak). So it was in this new context that I was reunited with Eli and first met Alex in person, the two performers working on my (now itinerant, but still officially Edinburgh-based) theatre company’s new piece, La Niña Barro. Sociopolitical and cultural contexts shaping artistic creation is a rather obvious thing, but less discussed and perhaps more intriguing is to analyse how a geographical context can influence devising a piece of theatre (that is not site-specific). We hadn’t thought about that until the three of us got together in real life – Eli and Alex were born and bred in Alicante and therefore stopped noticing their surroundings. I had never been there before and therefore couldn’t have a clear idea of what the place looked like. Inevitably, the sensations gained from long, warm, dry afternoons spent on the porch of Eli’s house gazing up at the mountains and arid land of red clay around them, made their way into the aesthetics of the piece and helped us define colours, movement and sound. This might be the best argument against the digital/virtual, theatremaking that we initially used, flagged by a few peers as a potentially detrimental thing to our art, and something that could easily become a good excuse for the issuing of even fewer artist visas. There are, of course, many successful theatre productions that make use of technology, and in our case, it was the only possible way of getting the project started, but I agree that it shouldn’t be seen as a suitable replacement for presential work. After all, this is theatre/performance’s “unique selling point” against film – it is the live experience that makes it so special.